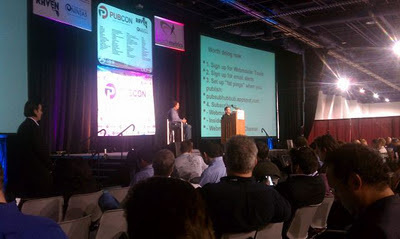 Following are some of the points which Matt Cutts and Amit Singhal of Google made at the Keynote Session of Pubcon Vegas 2011 on Day 2. These points have been jotted down by following #pubcon on Twitter. Good editorial links matter. Bad links do not. Quality beats quantity .A really good editorial link can go a long way. SEO is like coaching” helps you put your best face forward. Search is personal and will continue to get more personal. Only rolling out SSL to http://google.com not to Google.ca, Google.fr etc. Just too complicated for now. Google looks at over 200 signals to determine link quality. Some sites may have 10,000 backlinks, but Google may not be crediting any of them. People don’t see what links we trust and what links we don’t trust. On Author Authority – Visitors want to know a high quality author wrote it and why the author is high quality. Google likes to make changes algorithmically because it scales across languages, etc. Google always prefers algorithms to human intervention. If the internet remains healthy, Google will remain healthy. A very big thanks to all the people who shared the event with their live posts on Twitter.